The Game Max Titan PC case is an ATX gaming case and enhances our Game Max range further with a top cover with a removable dust filter, the front panel made from mesh steel gives the case high end cooling. The clear side window allows users to see the 1 x 12cm Blue fan on the back will keep your components cool and colourful, the case also has 2 x 12cm Blue 15 LED fans on the front. A luxurious black interior and rolled edges for safety makes this design simply outstanding. 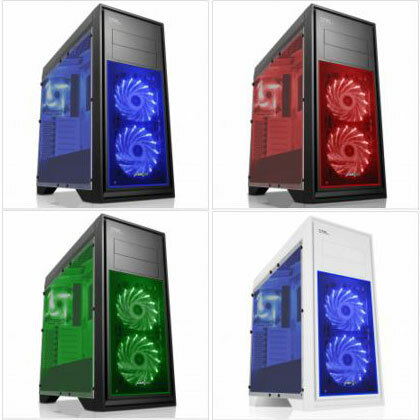 This case supports ATX, Micro ATX and Mini ITX motherboards.